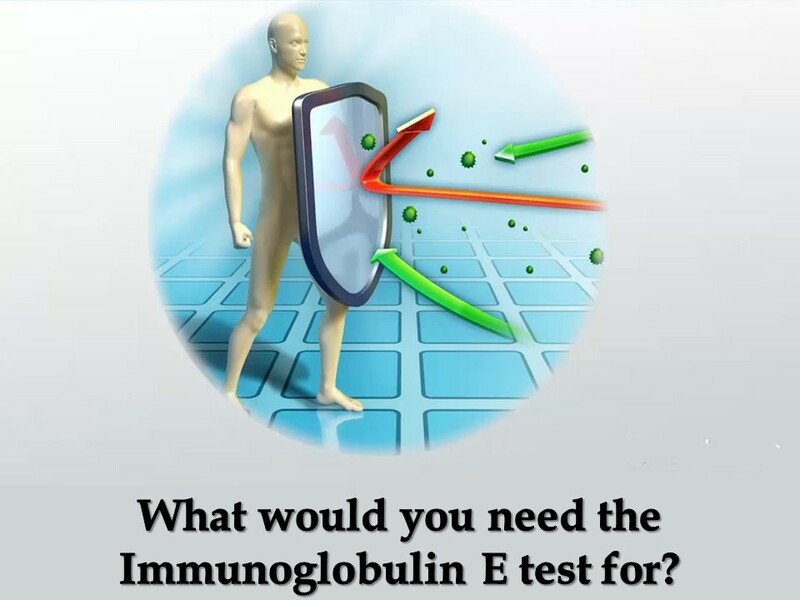 What would you need the Immunoglobulin E test for? Home / Health & Beauty Tips / What would you need the Immunoglobulin E test for? The IgE test is used for the Immunoglobulin E. It is a type of antibody, which is produced by the immune system to protect the body from viruses, bacteria and allergens. The antibodies are found is scarce amounts in the blood in general. The higher amounts signify that the body is reacting to the allergens. The result is that there could be an allergic reaction. The levels could also be high if there is an infection and the body is fighting against it. The infections could be from parasites or some other problems with the immune system. The IgE tests might be performed to find out the allergens in a child or if there is an infection with a parasite or a problem with the immune system. The test would be a simple blood test where the blood drawn would be tested in a lab. The doctor would be checking for levels of Immunoglobulin E in the blood quite similar to a hemoglobin test or gtt. How should the child be prepared for the IgE test? The child would be able to eat and drink normally if there are no other tests involved. The doctor should be informed about the medicines that the child might take. They could be affecting the test results. This one, like most of the blood tests, would draw a small amount of blood from the vein. A health professional would clean the skin, put an elastic band above the area so that the veins get filled with blood. A needle is inserted into the vein on the inside of the arm and blood is drawn. The blood sample is pulled into a vial and the needle and elastic band are removed. Sometimes, 'heel stick collection' is preferred in babies. It is quite similar to an RBC count. Staying within the RBC normal range would indicate that the individual is free from most blood-related diseases. How long would the IgE test generally take? Most blood tests generally do not take too long. However, it might be hard to find a vein at times and the technician might take a little more time. Parents are usually allowed to stay with the child during the blood test. This is to encourage the child to relax. The children should be made to sit still because tensing muscles might make it difficult to draw blood. Also, the parents might try to make the child look away when the blood is drawn so that they do not panic. The child can be kept calm by singing a favorite song. What would follow the IgE test? The technician would remove the elastic band and the needle. The are would be covered with a cotton plug. A bandage is also used at times to stop the bleeding. If any mild bruising is present, it would go away in a few days. The blood samples would be processed by a machine. The results for the test can be availed shortly. The doctor might even order other tests if there are problems seen in the test results. The IgE test is a totally safe procedure and risks are minimal. Some kids tend to feel lightheaded from the test. Many kids and teens fear the needles quite strongly. You could talk to the doctor to make the procedure easier if the child seems anxious. The small bruise around the test site is quite common and can last for a few days. Medical care might be needed for the child if the discomfort grows. The doctor or the healthcare professional would be able to help you with further information if needed. Thus, the IgE test would help to find out if your kid and teens are facing allergic reactions against a substance.